Expect excellent coconut flavor and consistency from Aroy-D canned coconut milk. Aroy-D is famous throughout Thailand, and the parent company is Thai Agri Foods which is one of the few truly "premium" food processors in Thailand using the finest state-of-the-art machinery. We always have the freshest stock on hand. Coconut milk is prevalent in Thai cooking, from main dish to appetizer to dessert. Below are just some of the many recipes that require coconut milk, find much more in our Thai recipe section. 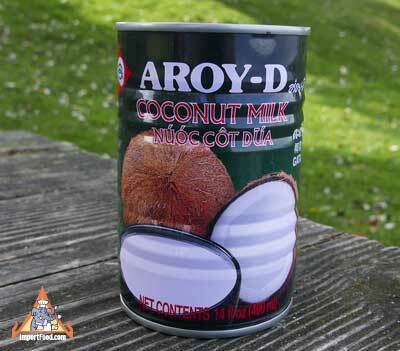 Ingredients: coconut milk 55%, water, potassium metabisulfite (as perservative). Unsweetened. Product of Thailand.